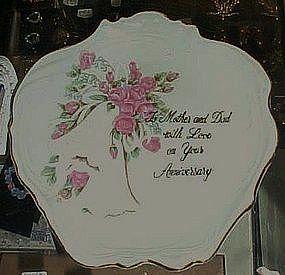 This vintage celebration plate is a wonderful gift for any anniversary for Mom and Dad. Decorated with wedding bells and a spray of pink roses. Real gold accents and trim. Measures 8 x 8.5 inches. Made of nice porcelain and is in perfect condition. It has a hanger on the back. This was probably made by Lefton china, as it bears gold numbers on the back 5516.